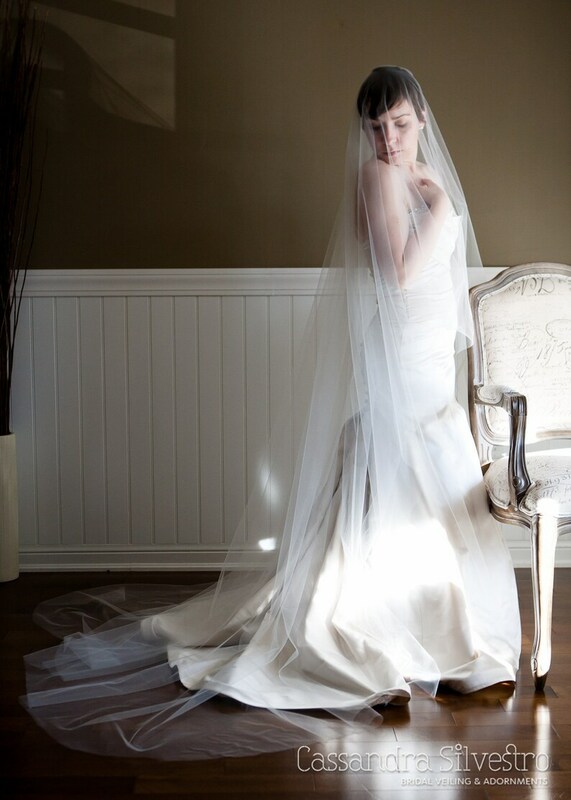 This stunning raw edge drop veil speaks for itself with it's 105" width and 30" waist length blusher in the front. 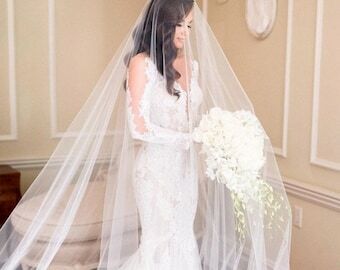 Each veil is custom handmade to order using only the highest quality, and softest bridal illusion tulle available; and is attached to a clear comb to create a beautiful sheer effect, with no gathering. 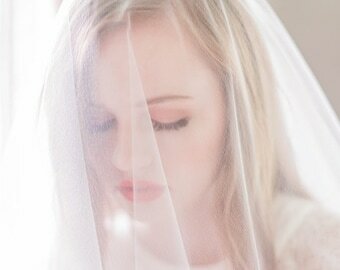 The veil is available in blush pink, white, diamond white, light ivory and ivory. The white is a stark, bright white and the diamond white is a soft, slightly off white. This piece should arrive approximately 4 weeks after placing your order. If you need it sooner than that, please contact me about a rush shipment or select express shipping at checkout. OMG. This veil is stunning. It’s the perfect length and after a steam it drapes wonderfully. It arrived beautifully packaged with a lovely card from Cassandra. I can’t wait to wear this on our wedding day! This veil was AMAZING. If you are looking for a veil that is elegant and does not take away from your dress than this is it. Best purchase by far. I bedazzled my veil with added pearls and I also ordered it longer than I ended up using it. I had to shorten it. Pros: This seller sent the veil very quickly and the cost was extremely reasonable. Cons: It wasn't as soft as I thought it would be. The holes were bigger than I would have liked. It looked porous in photos and it had a plastic comb that does not stay in the hair (metal is much better). I was completely blown away! The veil is exactly what I wanted and more!!! I had inquired about the difference in color between the diamond white and white but had no time to wait for swatches. Cassandra was gracious enough to provide me the veil in both colors. I literally cried when I opened the package and read her hand written note. She is amazing!!!!!!! I cannot wait to wear this beautiful creation on my wedding day!